On July 7, 1928, the Chillicothe Baking Company in northwest Missouri became the first commercial bakery in recorded history to have bread mechanically cut into uniform slices. The invention, developed by Otto Rohwedder of Iowa, revolutionized the baking world. 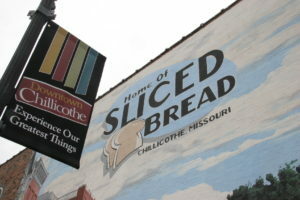 To celebrate the 90-year milestone, the town of Chillicothe is gearing up for its first annual Missouri Sliced Bread Day on Saturday. Pamela Klingerman, curator of the Grand River Historical Society Museum in Chillicothe, says Rohwedder was friends with Frank Bench. Bench’s family owned the bakery. Bench, who worked in the bakery part-time to save money for college, did the honors that day in 1928 by firing up the bread slicer for use. The cost to slice a loaf of bread back then is unknown but the machine’s popularity grew instantly. About two months ago, a 106-year-old woman visited the museum in Chillicothe to see the bread slicer. She recalls her family putting on their dress clothes and going to watch bread being sliced at a store in South Bend. The woman was about 11 years old at the time. “Can you imagine getting dressed up just to go watch a machine slice bread? That’s the kind of impact it had on society at the time,” she says. Klingergman says the machine’s purpose affected the way of life for many, including as a huge labor-saving device for housewives. Klingerman says the slicer also transformed the small appliance industry. “Prior to this, the pop-up toaster had been invented but it didn’t go anywhere because people couldn’t, for the most part, make bread slices uniform to put in it. So, they got jammed up or they went in and got burned because the slices were too thin,” she says. The Smithsonian Museum has loaned the original bread slicer to Klingerman’s museum. The machine weighs in at more than 1,000 pounds. Bread lovers ready to binge their way to carb heaven can take it all in on Saturday. The activities you might expect to see at a festival all about bread will be there, including a French toast breakfast, bread baking contest, bread tasting, “The Greatest Parade Since Sliced Bread” and the Sliced Bread Jam Bluegrass festival. Other features of the day include a flea market, 5K run, open mic competition, historic preservation workshop and the largest fireworks display in northwest Missouri. State Rep. Rusty Black, R-Chillicothe will judge Saturday’s bread baking contest. Prizes being awarded for the top honors will be riding on the taste buds of Black. About ten local groups are teaming up to put on tomorrow’s Missouri Sliced Bread Day events in the community of 21,000. Klingerman thinks they will have plenty of bread to go around.